In 1810 William Birch left Plymouth for London and started a business running horse-drawn cabs. His daughter-in-law Elizabeth & her two sons carried on the business which progressed to horsedrawn buses in 1847, running between Pimlico and Mansion House. Throughout the rest of the 19th century Birches expanded to take in further routes in London as members of various horse omnibus associations until the last of these associations were eventually disbanded in 1909. 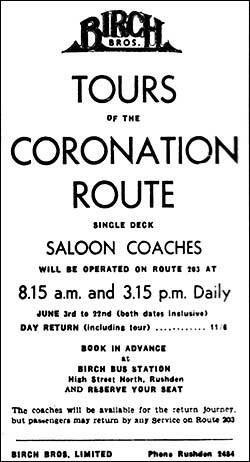 1953 Coronation Route - cost 11/6d. As part of their expansion several smaller operators were acquired in Hertfordshire and Bedfordshire and in May 1938 Birch turned their attention to the Rushden area. They took over Abbott & Sons, G. Robinson, & G. H. Scroxton. A bus depot had been built in High Street North in 1937 and by 1940 double deckers were running on the London to Rushden route. There were also additional routes to Luton, Harrold, Wellingborough & Kettering but their principal route was always London, Kings Cross through Welwyn, Hitchin and Bedford to Rushden. 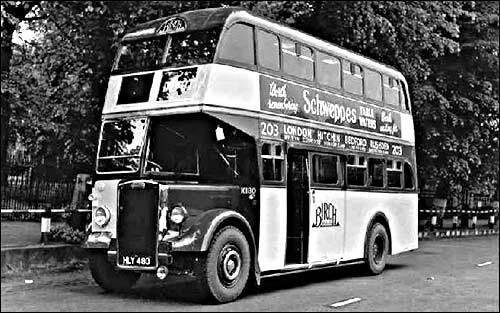 The 203 operated hourly in the 1950s with mainly ‘Marlborough’ class double deckers which seated 53 and the journey took 3 hours. In 1949 the coach and bus business was split into two separate companies. 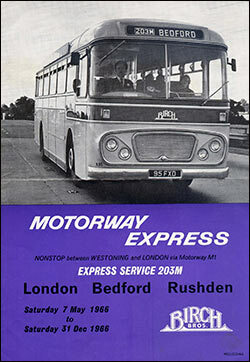 In October 1959 part of the main 203 service was rerouted via the newly opened M1 making for a much faster journey. Double deckers were not allowed on the motorway so single deckers numbered 203M were brought into service. Gradually the original 203 service was reduced. On 14th September 1969 the 203 & 203M bus routes were sold to United Counties together with twelve vehicles and the depot in Rushden was also sold. The Birch name lived on with their coach business running from the depot in Kentish Town. On 1st February 1971 the business and coaches were sold to the George Ewer Group and so Birch's faded from the public transport scene forever. 213 & 215 were both short lived routes.